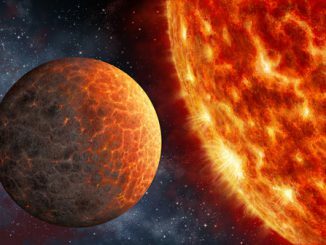 Astronomers using NASA’s Kepler space telescope have found a planet 219 light-years away that seems to be a close relative to Venus. 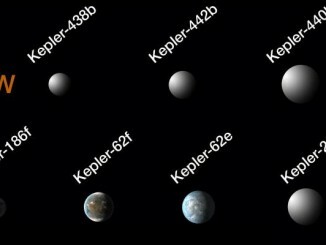 This newly discovered world is only slightly larger than Earth and orbits a low-temperature star called Kepler-1649 that’s one-fifth the diameter of our Sun. 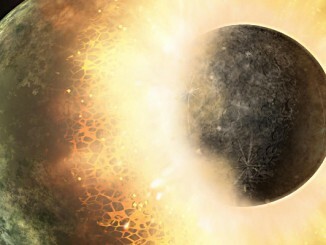 New theoretical modelling of the ancient history of the Earth and the Moon suggests that the giant collision that spawned our natural satellite may have left Earth spinning very fast, and with its spin axis highly tilted. The simulations give new insight into the question of whether planets with big moons are more likely to have moderate climates and life. If you cast your eyes toward the constellation Cygnus, you’ll be looking in the direction of the largest planet yet discovered with the widest orbit around a double-star system. It’s too faint to see with the naked eye, but a team led by astronomers from NASA’s Goddard Space Flight Center and San Diego State University used NASA’s Kepler Space Telescope to identify the new planet. 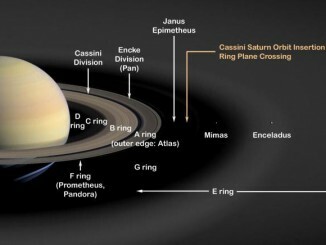 New research suggests that some of Saturn’s icy moons, as well as its famous rings, might be modern adornments. Their dramatic birth may have taken place a mere 100 million years ago. This would date the formation of the major moons of Saturn, with the exception of more distant Titan and Iapetus, to the relatively recent Cretaceous Period — the era of the dinosaurs. 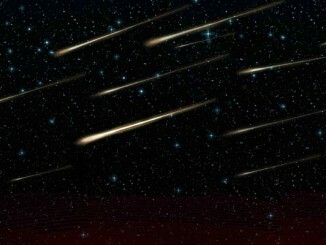 A new network of video surveillance cameras in New Zealand detected a surprise meteor shower on New Year’s Eve. The shower is called the Volantids, named after the constellation Volans, the flying fish, from which the meteoroids appear to stream towards us. The shower was not seen the year before and is not known from past radar observations. It could be an early warning that we should be looking for a potentially hazardous comet in that orbit. 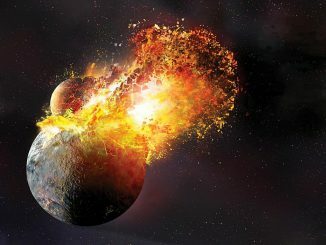 The Moon was formed by a violent, head-on collision between the early Earth and a “planetary embryo” called Theia (pronounced THAY-eh) approximately 100 million years after the Earth formed, UCLA scientists reveal. 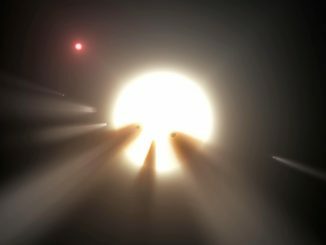 This new research also refutes the work of a team of German scientists who, in 2014, reported that the Moon also has its own unique ratio of oxygen isotopes, different from Earth’s. ﻿How many stars like our Sun host planets like our Earth? 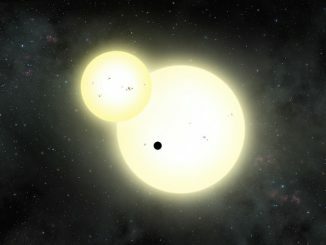 NASA’s Kepler Space Telescope continuously monitored more than 150,000 stars beyond our solar system, and to date has offered scientists an assortment of more than 4,000 candidate planets for further study — the 1,000th of which was recently verified. 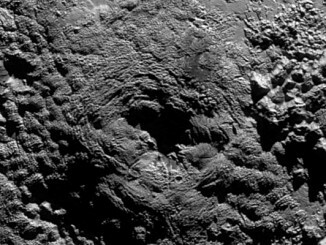 From possible ice volcanoes to twirling moons, NASA’s New Horizons science team is discussing more than 50 exciting discoveries about Pluto at this week’s 47th Annual Meeting of the American Astronomical Society’s Division for Planetary Sciences. The two cryovolcano candidates are large features measuring tens of miles across and several miles high. 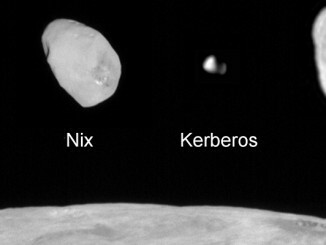 Images just sent back to Earth this week of Pluto’s tiny moon tiny Kerberos taken by NASA’s New Horizons spacecraft complete the family portrait of Pluto’s moons. Kerberos has a double-lobed shape suggesting that it could have been formed by the merger of two smaller objects. It also appears to be smaller than scientists expected and has a highly-reflective surface, counter to predictions prior to the Pluto flyby in July.